A development’s impact on the landscape and on views often causes considerable concern amongst the public as the changes are obvious to anyone. We have experience in undertaking landscape and visual impact assessments as set out in The Institute of Environmental Management and The Landscape Institute in Guidelines for Landscape and Visual Assessment. • Research and survey; both desktop and field studies to assemble basic required information. • Analysis; detailed examination of the constituent parts of the landscape and scoring the importance of the various aspects of the landscape and visual amenity. Alongside this, we can produce presentations for public consultations or public inquiries and provide expert evidence on the landscape. With Local Authorities wanting more and more information up front we have found that with larger schemes that often need revising once the initial scheme has been submitted it is a prudent step to submit a Master Plan at the initial stage. A Master Plan will include the location of all planting areas, hedges etc but will come with an indicative planting schedule giving the planners information on general planting species and sizes. This Master Planning generally costs between half - two thirds of the cost of a full scheme. The Master Plan can then be worked up into a full planting plan once the layout has been confirmed, thus not wasting any of the initial design work. 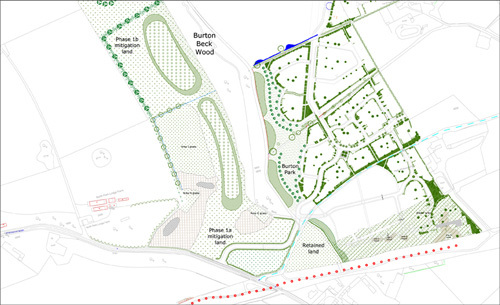 These Master Plans can be coloured up if required. This is often very useful in highlighting the amount of landscaping and screening provided on site and can be helpful where development is considered contusions.